Once a rather difficult exhibition venue to get to, it is now far better with regular services on London Overground via Clapham Junction to the south and a northern suburbs connection at Willesden Junction as far as Bedford. Hammersmith is a short walk and from Kensington in the other direction it is a short bus ride. There are District Line Underground services at the weekends but do check. Plenty of free parking nearby. If you are completely new to cruising and intrigued to discover what it is all about, or you are a seasoned cruiser, to spend a few hours at Olympia is well worth while. It is the quickest way to collect all the latest brochures in a very short time, an opportunity to hear a whole series of free lectures on a great variety of deep sea and river cruises. Learn not only about the ships but also the ancillary operations that make up the cruise industry. Readers can purchase reduced price tickets for £4 (on the door price is £10) by mentioning ‘BTN’ when booking tickets online or when calling 0871 620 4024. (Calls cost 13p per minute plus network extras). 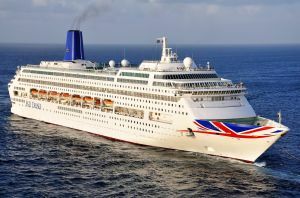 Over the last three weeks P&O’s 21-year-old Oriana has celebrated her coming of age with a multi-million pound refit at Hamburg followed by a two-night cruise out of Southampton. Named by HM The Queen as long ago as 1995 she has matured nicely and with a top cruising speed of 24 knots is the fastest ship in the P&O fleet. Your editor-in-chief, last on the ship 20 years ago, joined Oriana for what turned out to be a busy and enjoyable near-48hr trip to Zeebrugge for Bruges. The Ginsberg’s did not get off but many did. Oriana still seems modern, not too large and is very well laid out. 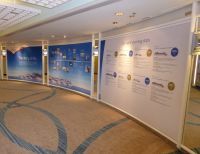 Much of the transformation cannot be seen with the ship being brought up to 21st century standards regarding engineering, IT and items such as air conditioning and wi-fi. The hull was scrubbed too, very important with regard to her energy use, and the outside painted. 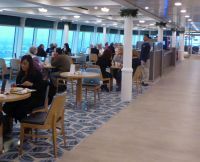 Nearly 4½ miles of carpeting was laid, a soft blue being used in the public areas, corridors and every cabin. It all tones in very nicely. It took 1,300 contractors from 35 companies working 24hr a day to complete the job. The whole operation was managed by a specialist team from P&O owner Carnival. Cabins were refurbished at the rate of 50 per day involving new carpets, bedding, curtains and soft furniture. The eight suites were completely remodelled. Southampton is P&O’s UK gateway port with domestic air connections locally and Heathrow 75min away by road. There are train services from London and the north whilst P&O also offers a number of regional pick-up points. 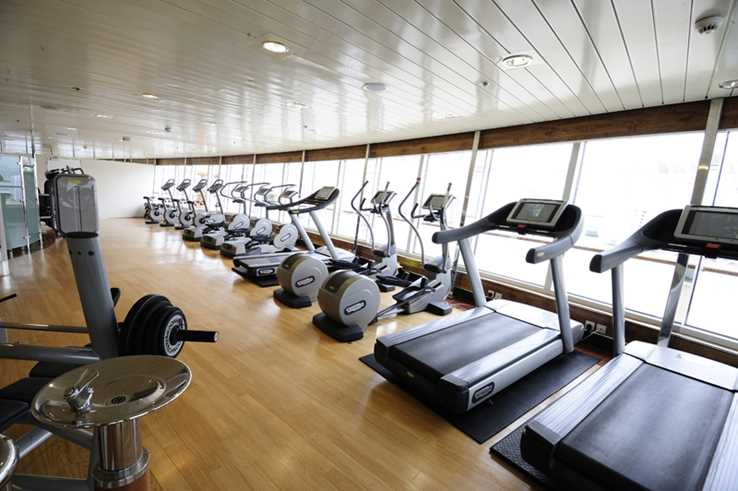 The Mayflower Cruise Terminal has easy access and is fully covered for embarking and disembarking passengers. An alternative is to overnight at the close by Holiday Inn where they offer a £175 room and breakfast package including transfer to the ship and parking (up to 14 nights). It is particularly ideal for families as it does not matter how many you have in the room. Boarding the ship was quick and efficient. The compulsory passenger briefing in one of the lounges was easily the best and most thorough ever experienced with the captain telling us all that the ship was “fresh and friendly out of Hamburg”. It is amazing to think but when Oriana was christened all those years back at 69,000 tons she was one of the largest passenger liners afloat. Controversial, in that she was assembled in Papenburg (Germany), and not a British yard, she is considered to be one of the first purpose-built really modern cruise ships. Where Oriana does differ from later vessels is the limited provision of balcony cabins just 118 out of 936. We have also moved on in terms of wheelchair accessibility only eight cabins having this provision. Since November 2011 she has been Adult Only and now has the new distinctive P&O blue style funnel. The yellow Orient Line smokestack from yesteryear is gone from the fleet. She has 28 single cabins. Who takes a two-night cruise? Oriana was completely full for this trip – 1,880 passengers and 760 crew plus some engineers from Germany to tidy things up. The first answer is easy. The many who have never been on a sea-going holiday and wanted a short sample trip. Some on board were back to back (staying on for the Christmas cruise – and gaining the advantage of P&O’s back-to-back deals), others having a weekend away ‘all inclusive’ the cost much the same as a two-night land-based weekend but including top quality entertainment, or on this occasion a chance to visit a continental Christmas market. There were a number of groups on board and at least five Solent-based companies had chosen Oriana for their Christmas party. At something around £250 per head it is a good deal. For heavy drinkers it will cost more but in any event P&O on board bar prices are very reasonable. My experience of Oriana was 20 years ago but it is a timeless ship. There is a good amount of outdoor space, with enough sun loungers for all passengers and there is an extra-wide, traditional walk-around outdoor promenade deck. The stern superstructure is nicely rounded, with several tiers that overlook one of three swimming pools and a hot tub. The L-shaped Anderson’s Lounge – named after Arthur Anderson, founder of the Peninsular Steam Navigation Company in the 1830s – contains an attractive series of 19th-century marine paintings and is decorated in the manner of a fine London club. Atop the ship and forward is the Crow’s Nest, a U-shaped observation lounge with one small wing that can be closed off for private groups. A long bar includes a model of Oriana and others in a glass case. Two small stages are set into the forward port and starboard sections, each with a wooden dance floor. Smoking is permitted in a limited number designated spots on the open decks. The library is a fine room, with a good range of hardback books and a librarian, inlaid wood tables and bookcases crafted by Lord Linley’s company, and some comfortable chairs. Adjacent is Thackeray’s, a reading/writing room named after the novelist William Makepeace Thackeray, a P&O passenger in 1844. He, like us, would probably have appreciated the wi-fi, had it been around in those days. Lord’s Tavern, decorated with cricket memorabilia, is the most sporting place to pitch a beverage or two, or take part in a sing-along. Crystal Palace v Chelsea was shown and we all got excited with Leicester City’s valiant comeback. There is also a fine cinema, unusual for ships these days, and a small casino with table games and slot machines. 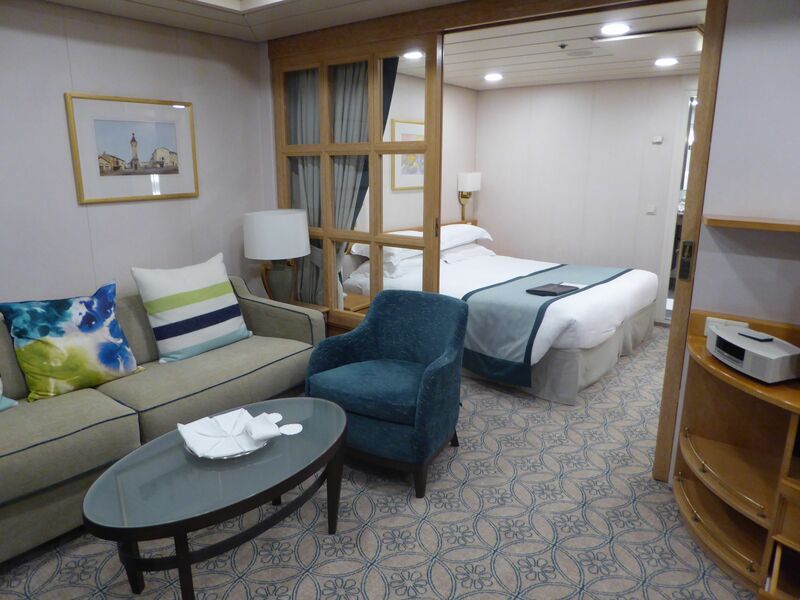 There are eight suites, all of them completely refurbished during the docking. Facilities include butler service, separate bedroom and a walk-in dressing area. The bathroom has a whirlpool bath and there is priority embarkation at Southampton. The balance of balcony cabins are very adequate rather than large but do have baths and a drawback heavy curtain between the bed and lounge area. One of the party can watch TV whilst one’s companion can do other things. 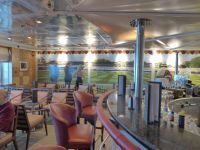 Throughout the ship the opportunity has been taken to replace well-worn seating and furnishings. The lovely Theatre Royal has been given a particularly fine makeover, the seats with new coverings looking and feeling new. The stage itself has undergone a technical rehab, not obvious to the audience but much appreciated by the entertainers. Maybe the lights gave trouble in the past? This is not a full review of the ship nor what is available during a normal cruise. When it was built most of its contemporaries offered two dining sittings and that was it. Now customers demand more and within its limits Oriana tries to cope. Marco Pierre White is the mastermind behind the menus. Oriana has a pair of main places to eat, the Oriental with two sittings, and the Peninsular with ‘freedom’ dining. Sindu is an Indian restaurant with a British touch which you can book, the extra charges modest. The cooking ought to very good, P&O for all its 175 years relying on staff from the sub-continent. The Conservatory, a buffet style operation for breakfast, lunch, dinner and late night refreshment, has been completely and very well remodelled. One section offers the Beach House in the evening (for a small supplement) where you can cook your own meat (supplied). We rather liked Al Fresco, quiet for breakfast with omelettes to your choice, and a light lunch available. It would make for a fine alternative dining venue in the evening. What about it P&O? On 3 January Oriana leaves for a 50-night trip stopping, amongst other places, at Rio, Stanley, Punta Arenas (the world’s most southerly city), Santiago and then back via the newly expanded Panama Canal. If you fancy leaving the cold behind for seven weeks a South American circular tour is to be recommended. It is summer in that part of the world. There are some cabins available from £5,449. She does another long (24-night) trip on 18 March taking in the Caribbean and Azores but for the rest of the year it is in and out of Southampton from 2 to 17 nights including the Mediterranean, Canary Islands, Northern Europe and the traditional round the British Isles tour. Douglas Ward in Cruising and Cruise Ships scores Oriana well in relation to the other seven ships in the P&O fleet. Ventura was the last one tried for any length of time. We might organise Oriana for sunny climes in 2017, or even Britannia.